Lock in a great price for Holiday Inn Rochester-Chatham - rated 8.1 by recent guests. Exallent friendly staff realy nice meal in restraunt not what i exspected at all from a holiday inn breakfast room packed with a coach party (bosch) but staff coped remarkably well ! Location for trip was great and the pool and jacuzzi were lovely. Lovely and clean shower. Warm room. Decent breakfast buffet. Staff polite. Nice little pool. Suited us perfectly for what we wanted in an overnight stay. All staff was very friendly and helpful even the decorator when I lost myself in a hall. Lots of choice for breakfast. Good value for money. We had an amazing time.Thank you! Everything was really good, will definitely be stopping again. 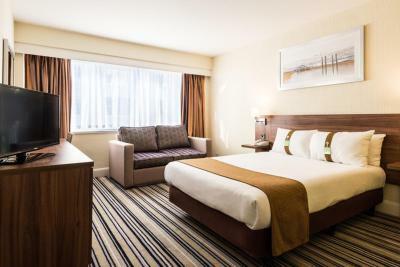 One of our top picks in Chatham.The modern Holiday Inn Rochester-Chatham hotel has fully air-conditioned bedrooms, a leisure club (with indoor swimming pool) and 24-hour room service. Children stay and eat for free! The fully equipped Spirit Health & Fitness Centre has a swimming pool, sauna, hot tub, steam room and gym. Every room at the Holiday Inn Rochester-Chatham has high-speed internet access. This Holiday Inn has a comfortable lounge bar, as well as Traders restaurant – serving modern cuisine for breakfast and dinner (lunch on Sundays). Children under 12 eat free when a paying adult is also dining. Access to the Holiday Inn Rochester-Chatham is easy via the M2 or M20, making it a central base in Kent or an easy stop on the way to Folkestone and Dover. This Holiday Inn is well located for Rochester Castle (2.3 miles), Chatham Historic Dockyard (3.5 miles), Dickens World (3.1 miles) and the Brands Hatch Race Circuit (17.4 miles). Holiday Inn Rochester-Chatham has been welcoming Booking.com guests since 22 Oct 2009. When would you like to stay at Holiday Inn Rochester-Chatham? This air-conditioned room has satellite TV, pay-per-view movies, and complimentary tea and coffee facilities. With bathrobes and black-out blinds. Our charming Rochester hotel is located by the historic aerodrome where you can relax with a drink in our bar or enjoy a delicious meal in Traders restaurant. You can make use of the Spirit Health Club and choose to work up a sweat in the gym or take it easy in the jacuzzi and sauna. House rules Holiday Inn Rochester-Chatham takes special requests - add in the next step! Holiday Inn Rochester-Chatham accepts these cards and reserves the right to temporarily hold an amount prior to arrival. The décor was shabby. The chairs in the bar area were ripped. We had to be moved as the throw at the end of the bed was stained and there were hairs on the pillow. The second room was not much better. The locker doors were hanging off in the changing room. Really not what I would expect from a Holiday Inn. I have stayed here previously and was surprised at how standards had slipped. Food a bit expensive and minimal choices. Easy to find, great check in - easy and fast. Little bit run down, need some repair. The heat of the hotel is a little high. Rooms could do a with a touch up. Paint peeling and marks and stains around the room.